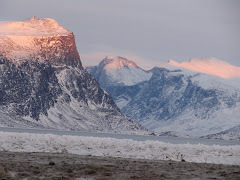 Pangnirtung Bound: What to do? I'm torn between my desire to chronicle all the preparation that's going on for my trip north and the fact that it's keeping me so busy. I decided to take a quick break from my cleaning (because I hate it) to jot down a quit entry. Yesterday wa s full of phone calls, emails, and various shopping stops. I made a final vet appointment for Gryphon's neuter and overall check-up. I've already asked about taking the two dogs north and my vet seems to think they'll be fine; neither can influence their core temperature like a husky but, by keeping them inside, they should be ok. For the past few weeks I've been trying to wean the two of them off the pee pads and introduce newsprint, the cheaper option. No luck. It doesn't absorb anything, so the dogs refuse to use it. I guess that means an additional thing to pack. Grrr. Yesterday I also put in order for another box of contacts...they should be ready tomorrow. Although a few people have mentioned it might be a superfluous purchase, I disagree. Have you ever had to deal with the fogging up of glasses or, worse yet, the frames cracking because of the temperature variations? $40 for 6 seems like a good deal. Also, I had to hunt down some appropriate work shoes. My super-duper Sorel boots will be ordered soon, but I still need to have something for inside. Currently, I have pointy heels in every colour imaginable (love the hot pink snakeskin) but, well, you know. I got some funky sneaker-esque soled dress shoes that should work. To Fairweather...got a great all-purpose sweater that should work with just about everything. Home: I sat down with my laptop and started sending out 'thank you' emails to the long-list of people who have helped me out (references, contacts, friends, etc.). Finally, I received the various documents attached to an email from my employer (official offer, housing application, direct deposit form, etc.). Every day it feels more and more real. Phone calls, phone calls. Contacts to ask about things to bring, doctor to make an appointment. Finally, I contacted my landlord to let him know that I'd have to break my lease; he was pretty cool with it (all things considered). Now comes the part when people are traipsing through my apartment look for a place to rent for September. In fact, tomorrow morning there is already someone scheduled for a walk-though. Today I have a huge afternoon of straightening, scraping, and scrubbing to look forward to. Oh what joy. I'm such a procrastinator when it comes to that sort of thing (as many of you know). It's so much easier to get caught up surfing the web. Ahh, another thing...I just found out that there's no Bell Mobility service in Pangnirtung. This basically means that the current contract I have signed has to be bought out (about $400) or transferred. Finding someone to take a Bell contract isn't the easiest considering all the nastiness they regularly put their customers through. Well, I suppose there's no good excuse to continue. There are always more things to write but there is very rarely any time to do it. Selling a Bell contract = Selling a contract to Hell. pretty much...it doesn't even provide you with the short-term benefits most 'deals with the devil' include. what's that about? Try one of those websites to link you with someone looking to take over a contract! I know this is one -http://ca.cellswapper.com/ - but there are others out there! I feel your pain. I have a corporate contract until next year through Rogers and it is actually cheaper to pay the monthly bill until it runs out, then to pay the cancellation fee. There is something not right about that . . .